Jaques Brown is a senior at Gage Park High School in Chicago. 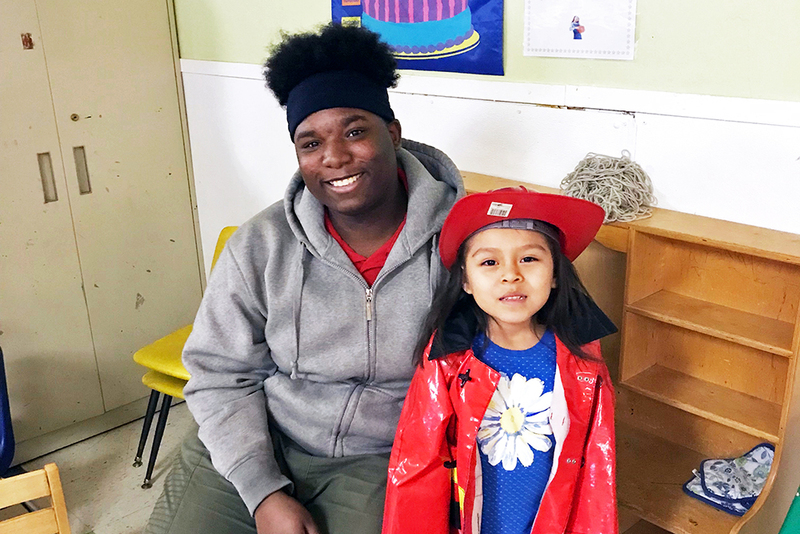 Since first serving with buildOn in January 2018, Jaques has dedicated himself to serving his Chicago community. He shared the following service story at the 2018 buildOn Chicago Breakfast. I had never served my community until Martin Luther King Day. Even though I didn’t feel like getting up, my best friend Jamia called me early in the morning and made sure I went to buildOn because she knew I needed service in my life. That day we taught kids at a family center in Pilsen about MLK, and I saw there was one little girl who was quiet as a mouse. She was about six years old and she didn’t talk to anybody—whenever someone talked to her, she would just nod her head “yes” or “no.” So I decided that I would work with her, and I was going to get her to come out of her shell. I started reading a book to her and asking her all sorts of questions. And she was nodding “yes” and “no,” so I asked her to tell me about herself and to my surprise she started talking to me. She told me that her name was Kenya, but instead of telling me about all the good stuff in her life, she told me about everything she was worried about. She told me about her family, about how she didn’t come from a lot. And she told me stuff that no kid should have to worry about, like how she took care of her grandma, who was sick. I love kids, and I didn’t want her to worry about all that, so I told her to look at how bright the future is, and not to worry about what’s dark in the past. I love kids, and I didn’t want her to worry about all that, so I told her to look at how bright the future is, and not to worry about what’s dark in the past. I told her that she needed to focus on being a little kid and just having fun. I could tell that really meant a lot to her. We were able to have fun that day and she didn’t have to worry about anything. At the end of the day, we took a picture together and she told me that she was going to miss me. Above: Jaques and Kenya took a picture together after they bonded on Martin Luther King Jr. Day. But what Kenya doesn’t know, is that day really helped me, too. You see, just like Kenya, I don’t come from a lot either—I grew up living with my mom and my sisters, and we struggled financially. We had to move around Chicago a lot because the neighborhoods weren’t safe. And I have a history of struggling with my anger. I would wake up angry and go to school angry. I’ve gotten into fights and been suspended. But working with Kenya showed me that instead of me being angry all the time and wanting to get into altercations all the time, I can be a role model. When I was talking to Kenya, I wanted to show her that there was so much more to life than anger, and it made me see that I can be whoever I want to be. When I was talking to Kenya, I wanted to show her that there was so much more to life than anger, and it made me see that I can be whoever I want to be. Since that day, I’ve dedicated myself to serving my community in Chicago. By tutoring kids, spending time with senior citizens, and making meals for people who are experiencing homelessness, I’m helping to make Chicago better for everyone. At the end of the last school year, something happened at school that made me angry. I got quiet and started shaking, but instead of acting on my anger I remembered that I had service with buildOn after school, and that helped me take that anger and change it into something positive, like focusing on my work at school and on service. When I’m at buildOn there’s just so much positive energy, and that helps me focus on all of the good we’re doing instead of focusing on the bad in life. To me, that quote means that no matter what your past is, you can do great things with your life by helping others. To me, that quote means that no matter what your past is, you can do great things with your life by helping others. My best friend Jamia brought me to service and that changed my perspective on life, and I’m proud of the fact that I’ve shown students who were spending too much time on the street that they can make the world a better place at buildOn. That’s what I love about buildOn—it’s shown students like me that even though we’ve gotten into altercations in the past, we can be great today because we can serve. 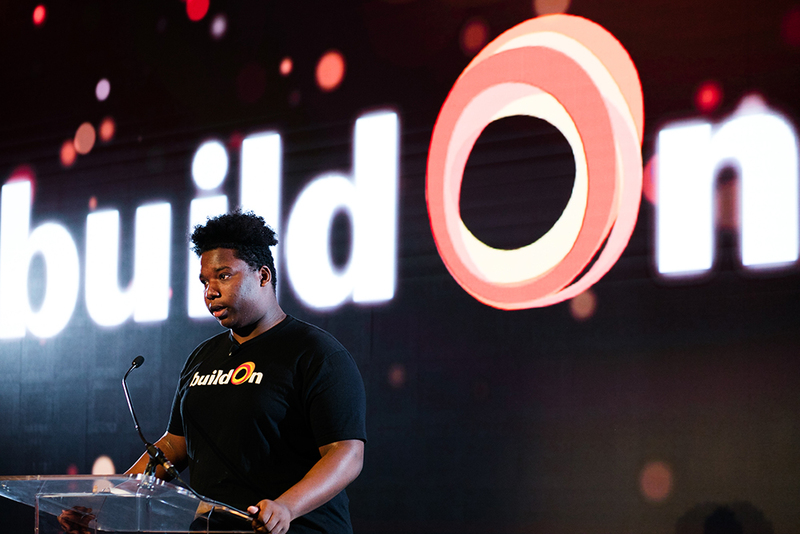 Below: Jaques shares his story at the 2018 buildOn Chicago Breakfast at the Ritz-Carlton, Chicago.